The cast for my Loud House Animal Style Spoof, The Cat House! Which Harvey kid from Harvey Street Kids can you see do nose rubbing on forefinger after sneezing to recover? DEEcat98 has started a donation pool! Hello I'm Diane and I love to draw and talk to my friends. I also have an obsession in watching Movies and Tv Shows, playing Video Games and reading books. I even love cute things! Now if you disagree with some of my opinions. I'll respect your opinions. Anyway hope all of you like my art and my Movie and Tv Show ideas! I am a big fangirl of The Loud House, Harvey Street Kids, and My Little Pony. But there are other shows I love as well! I also have a sneeze fetish where I am into cartoon sneezes. Here is a video to fit my love for sneezes. I have included Gerald in my Harvey Street Kids Sneeze Headcanons. Harvey Street Kids Sneeze HeadcanonsHere are my Harvey Street Kids sneeze headcanons. She has a average immune system where half of the times she can right away get infected by germs and allergies as she is the one out of the three Harvey Girls to have the most sensible sneezes. She tends to easily sneeze from pollen and dust. She also can sneeze from too much pepper. Her sneezes usually tend to be loud and stuffy and her nostrils flare up when she sneezes. Her sneezes can get wet when she gets sick. Mucus comes out of her mouth and nose as she is having sneeze sprays. At times she sneezes a bunch of times when she is having her usual sneezing fits. Sometimes she sneezes into her hands to cover her sneezes. But when Harvey Street Kids Season 2 comes out, should I include Zoe and maybe Chevron on there? 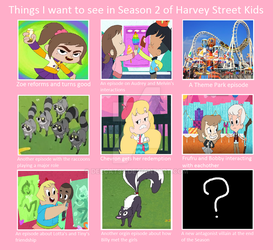 Anyone hoping for a Harvey Street Kids Season 3 after Season 2? I know I am! I may I thought of that a bit too early even when Season 2 is not out yet, but I really want more of Harvey Street Kids! If Harvey Street Kids does do character redemptions for it's later episodes where most of the antagonist characters on Harvey Street Kids change for the better by getting their redemptions which starts to make them nicer. How do you guys think it would affect the show? 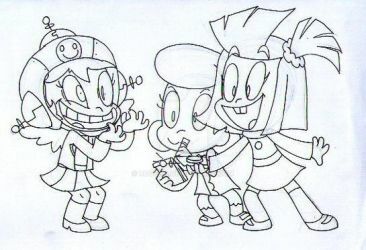 Harvey Street Kids/Harvey Girls Forever Role Play? Would anyone like to do a Harvey Street Kids aka Harvey Girls Forever role play with me under this journal if any of you have seen the show as it is a Dreamworks Netflix Original show? Well... do you know that Season 2 of Harveuy Street Kids ins officialy titled as Harvey Girls Forever? I admit, that I am surprised, isn't it? There have been Netflix shows that did get Season name changes. Harvey Street Kids isn't the first one to do it you know. Any chance you might continue your "Lisa, I Shrunk the Sisters" story? Maybe soon, you can make a trailer for your upcoming story, "Lisa, I Blew Up the Sister". And I thought of one story for you. "Lisa, We Shrunk Ourselves".